Calder’s Portraits: A New Language at the National Portrait Gallery: If you’re familiar with Alexander Calder, it’s most likely thanks to his mobiles, like this one designed for the National Gallery. But the artist also produced numerous sculptural portraits out of wire, including portraits of fellow artists, athletes and performers. Calder’s Portraits will explore the artist’s relationship with his subjects and his approach to caricature. On view March 11 to Aug. 14. Metro: Gallery Place-Chinatown. “Bill Cunningham: New York” at the Hirshhorn Museum: This new film follows the New York Times’ quirky and notoriously private fashion photographer of 30+ years, Bill Cunningham. Known for his egalitarian approach to high fashion (“I’m not interested in celebrities with their free dresses. I’m interested in clothes”), Cunningham authors the weekly “On the Street” video essay. In honor of the 80-year-old’s custom of riding around Manhattan on his Schwinn to capture fashion trends, the museum is giving away a “Cunningham-style” bike on Twitter today at noon. Watch the film’s trailer here. Screening March 10 at 8 p.m. in the Ring Auditorium. Admission is free, but seating is limited. Metrobus: L’Enfant Plaza or Smithsonian. 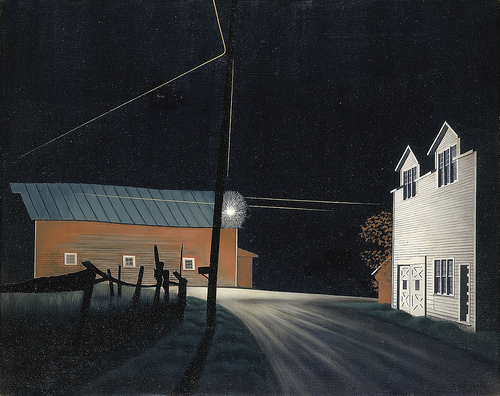 To Make a World: George Ault and 1940s America at the Smithsonian American Art Museum: The latest show at the SAAM offers an alternative vision of 1940s America as captured in the solemn rural landscapes and everyday scenes of painter George Ault and his contemporaries. Simultaneously calming and suffocating in their silence, Ault’s pictures depict “personal worlds of clarity and composure to offset a real world … in crisis” during and following the war. The exhibition was curated by Yale professor and celebrated American art scholar Alexander Nemerov and includes a few works by Edward Hopper and Andrew Wyeth. On view March 11 to Sept. 5. Exhibition talk/book signing by Nemerov (a great speaker) on March 11 from 7 to 8 p.m. Metro: Gallery Place-Chinatown. Image/Fame/Memory at Irvine Contemporary: After closing an eclectic exhibition of gallery artists, Irvine reopens this weekend with more of a crowd-pleaser. Image/Fame/Memory features intimate portraits of celebrities and artists by several important contemporary photographers, including Billy Name and Kate Simon. Also on view are Shepard Fairey’s screenprint revisions of works by those two artists. On view March 11 to April 16. Opening reception on March 11 from 6 to 8 p.m. Metro: Dupont Circle. Short list: Julia von Eichel: New Work at Addison/Ripley Fine Art; Opening at Gallery Plan B; Paint Mix at DCAC; Sketching in the Atrium at the Corcoran Gallery.